The granulators in the GRF series are based on the proven GSC series of machines. They are fitted with roller feeding devices specifically designed for the recycling of edge trim from sheet extrusion or skeletal waste in thermoforming applications. 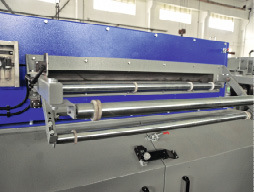 The compact soundproofed design allows these machines to be used inline where the regrind can be reintroduced into the production process immediately. © ZERMA Australasia Pty Ltd 2014. All Rights Reserved. 250 Hammond Road, Dandenong 3175 Melbourne Victoria Australia. Map & Directions.